For the last few years, Hackaday has really been stepping up our game with marketing materials. Our t-shirts and swag are second to none, and last year we introduced the ‘Benchoff Buck’ (featured above), a bill replete with Jolly Wrencher EURions that is not yet legal currency. At least until we get a sweet compound in the desert, that is. [Andrew Sowa] created the Benchoff Nickel. 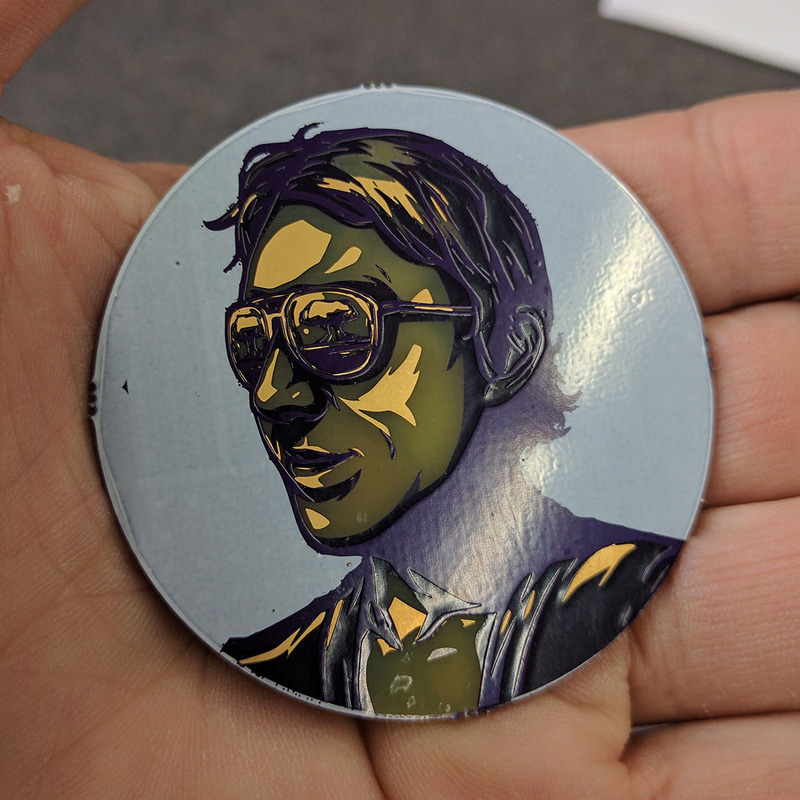 It’s a visage of yours truly emblazoned on a PCB, rendered in FR4, silkscreen, gold, and OSHPark’s royal purple. In doing so, [Andrew] has earned himself a field commission to the rank of lieutenant and can now reserve the dune buggy for a whole weekend. The Benchoff Nickel was created in KiCad using the Bitmap2Component functionality. Planning this required a little bit of work; there are only five colors you can get on an OSH Park PCB, from white to gold to beige to purple (soldermask on top of copper) to black (soldermask with no copper). Luckily, the best picture we have of me renders very well in five colors. The Bitmap2Component part of KiCad will only get you so far, though. It’s used mainly to put silkscreen logos on a board, and messing around with copper and mask layers is beyond its functionality. To import different layers of my face into different layers of a KiCad PCB, [Andrew] had to open up Notepad and make a few manual edits. It’s annoying, but yes, it can be done. The Benchoff Nickel can be found on Github and as a shared project on OSH Park ($22.55 for three copies). One little curiosity of the OSH Park fabrication process presented itself with [Andrew]’s second order of Benchoff Nickels. OSH Park uses at least two board houses to produce their PCBs, and one of them apparently uses a lighter shade of FR4. This resulted in a lighter skin tone for the second order of Benchoff Nickels. This is truly tremendous work. I’ve never seen anything like this, and it’s one of the best ‘artistic’ PCBs I’ve ever held in my hands. It was a really great surprise when [Andrew] handed me one of these at the Hackaday Unconference in Chicago. I’ll be talking to [Andrew] again this week at the Midwest RepRap festival, and we’re going to try and figure out some way to do a small run of Benchoff Nickels. Edit: OSH Park revealed why there are different tones of FR4. In short, there aren’t. The lighter shade of skintone is actually FR408, which is used on 4-layer boards.